Remember what we told you in our preview of the Laguna Seca race? That you just can't think of Laguna Seca without thinking of the famed Corkscrew corner. Indeed it was at that very corner that Valentino Rossi pulled off one of the more controversial overtaking manoeuvres in motorcycle racing, going over the kerbs and past Casey Stoner on the outside in 2008. The Honda team condemned him, and Vale's fans hailed him a genius. 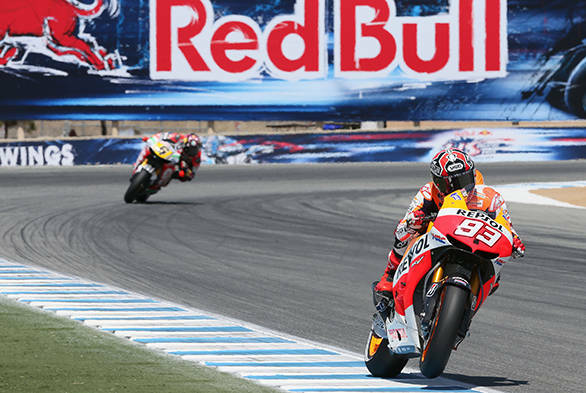 Five years later, The Doctor got a taste of his own medicine, when rookie Marc Marquez muscled his way past Rossi at the Corkscrew. The move was a blast from the past, only this time it was Marquez who came out ahead of Rossi. The Honda rider went on to win the race, and extend his lead in the championship to 16 points over second-placed Dani Pedrosa. Stefan Bradl took second place in the race, while Rossi finished the race third. Marquez might have put in a rather sublime performance during the race, but his qualifying session hadn't gone quite as planned. The 20-year old rider, after dominating the practice sessions, suffered a fall on Turn 5 that resulted in him losing out on time during the qualifying session. 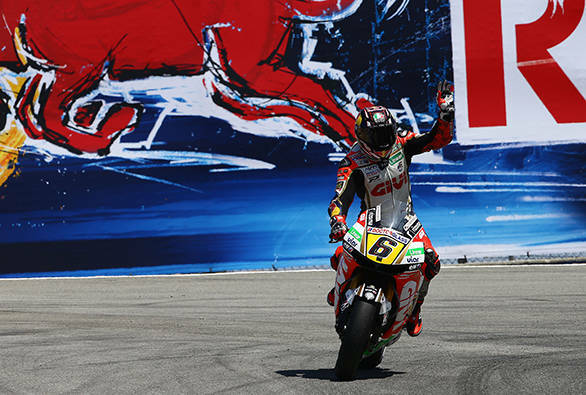 This meant that Stefan Bradl started the race on pole, his first ever first place start in the premier class. When the race started, it was Bradl who was off into the distance. Rossi settled for second, while Marquez was down in third. That didn't last all that long, with the Honda rider passing The Doctor on Yamaha at the Corkscrew. Then it was just a matter of catching and passing Bradl, which he did with relative ease, taking the chequered flag first. Finishing second was Bradl, while Rossi took the third step on the rostrum. Indeed it was also Vale's third podium finish in as many races, something the Yamaha team will be happy about. But what of MotoGP's two wounded soldiers? Well, Dani Pedrosa and Jorge Lorenzo, both with injured collarbones and shoulders, still managed to put in a strong enough performance. Just enough to keep them in the hunt for the title. Pedrosa finished the race fifth. While Lorenzo, struggled through the race feeling dizzy, and came in sixth. There's four weeks to go for the next round of the championship at Indianapolis. Time away could see Pedrosa and Lorenzo both recover enough to come back stronger than ever. An in form Rossi, recovered Pedrosa and Lorenzo, and lightening quick Marquez - the remaining races this season will certainly be exciting.